I was not legitimate until now. Until this review, I was not a real hot dog blogger. But now, it’s like I found platform 9 and 3 quarters, hopped on the mustard express, and magically traveled to the University of Wieners and Franks. I am real. In a Field of Dreams, I am Shoeless Joe Jackson. In the Matrix, I am Neo. In Ghost, I am Whoopi Goldberg. E.T. phone home… I have accomplished my dream. Papaya King is an incredibly legitimate establishment. Popular film and television programs such as Seinfeld, Anthony Bourdain, How I Met Your Mother, and Crossing Delancey have mentioned this place. Although it never got a mention on Gossip Girl, I promise you it’s famous. Ladies and Gentleman, Papaya King. Just look above these words. I don’t even need to write, but I will. On the Upper East side on 86th and Third Ave neon signs glow, beckoning all passers by to come in for a snack. There’s not much to this place, and there doesn’t need to be. The staff is very friendly, and they are proud to be there. When I asked for their best dog, the man behind the counter genuinely cared to know what my taste buds preferred. Eventually we came to the conclusion that I should have the classic. Sauerkraut and mustard. I knew that this was the classic coming into the place, and I was scared. Generally, I’m not a ‘kraut guy. I find it to be overbearing, and kind of like my Frankie’s on the Go post, that guy at the party who is loud and crappy and takes all the attention. But why, Jack? Why did I ever doubt the Germans? They invented the dog, why would I question their topping choices!? The spiciness of the mustard and the sour taste of the kraut mixed together to form this new harmonious flavor that I’d never tasted before. It reminds me of the first time I had a Yuengling. There’s something else out there? Shocked, I didn’t even realize how good the actual sausage was until the second bite. The snap is there, the temperature is perfect, and the bun is toasted with care. This is a dog of champions. Oh, and they’re 3 bucks? I’ll have another. 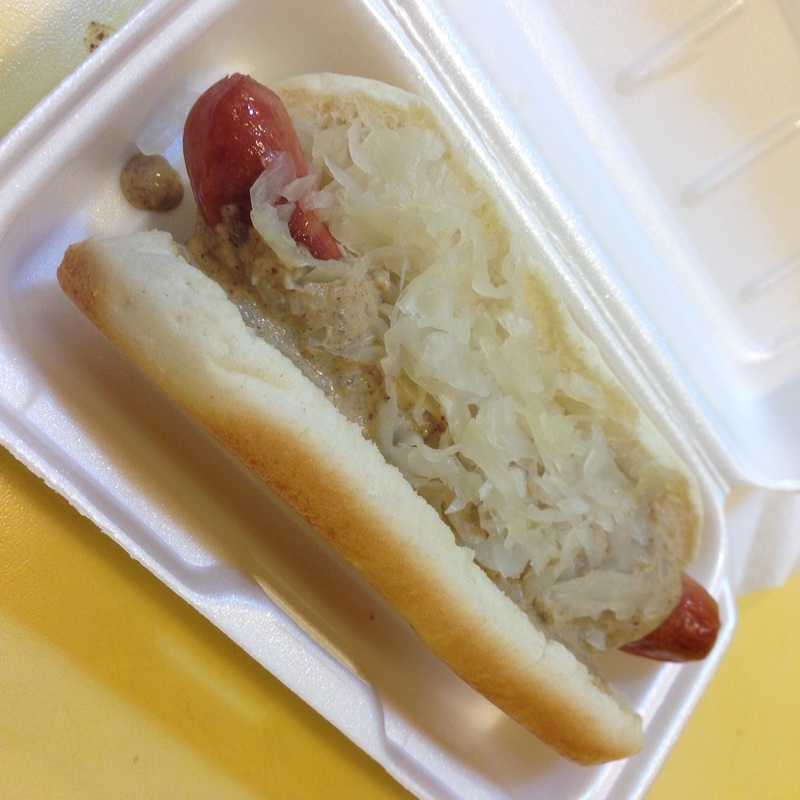 The second dog: plain with mustard. Look at those char marks on the dog. Look at how awesomely I placed the mustard on that bad boy. Look how epic-ly I devour it. I am in my element. Is this place perfect? Is this the best in New York? While it may be incredibly close, it never will be the king. For those that have read my “About Me” page, you know what I think about mustard. Keep it yellow. Papaya King does not have yellow mustard anywhere. I even asked, and it is nowhere to be found. While I kind of respect them for sticking to their guns, the fact of the matter is that they’ve made the wrong choice. I don’t care how much money Gulden’s is giving you, the better choice is to take money out of your pocket and literally pay French’s to be your sauce. At least have it in your restaurant. 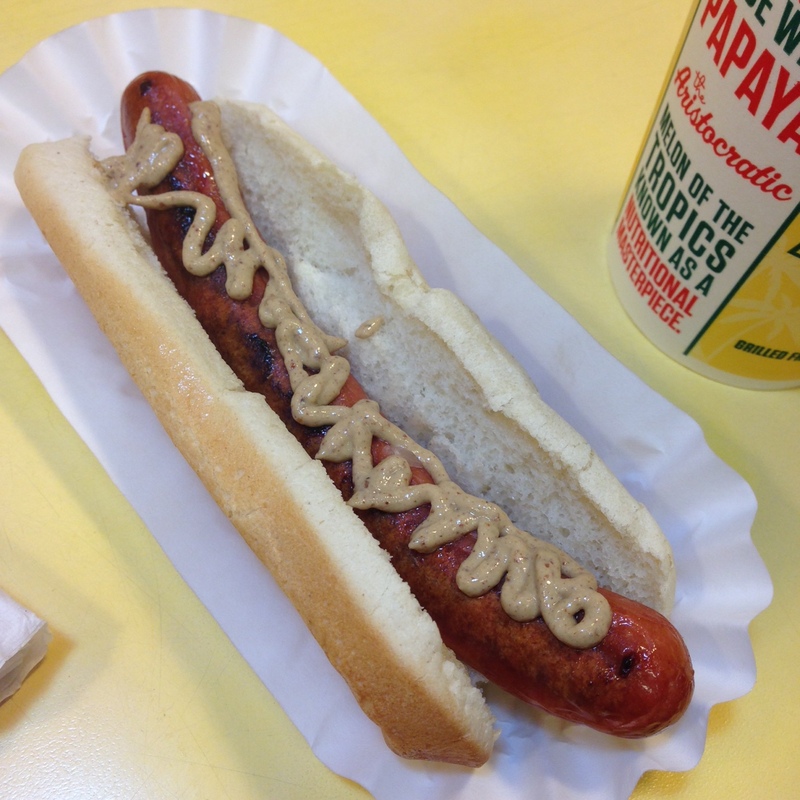 Papaya King gets 4.5 weenies. I absolutely love this place. I will be back, and it is definitely the best quality dog I’ve had in New York so far. However, I do believe that there is an establishment out there that knows how important yellow mustard is, and can rival this landmark in quality. I’ll leave you all with this quote from the great philosopher Friedrich Nietzsche: “And those who were seen dancing were thought to be insane by those who could not hear the music.” Mustard is my music, and the rhythm I dance to is yellow. It is this music that blasts throughout my soul. Stay yellow, my friends.